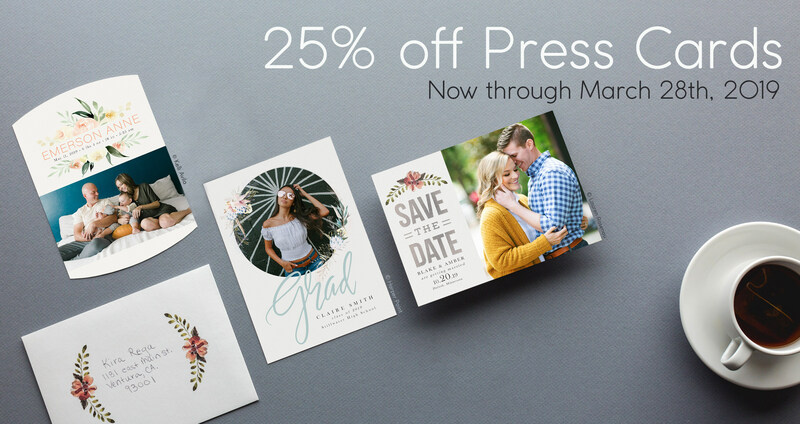 Now through March 28th, enjoy 25% off Press Cards (no code required). Celebrate the brightest occasions with personalized greetings printed on premium press papers. From traditional Flat Cards to Luxe and Foil, you have an endless array of timeless options to bring your vision to life. And as always, your order will ship in as little as 1-2 business days with free overnight shipping. Please Note: This offer applies to Accordion Cards, Flat Cards, Flat Luxe Cards, Foil Pressed Cards, Folded Cards, Folded Foil Pressed Cards, Folded Luxe Cards and Luxe Pop Cards through ROES, Web Ordering and Designer Plus. All Business Cards and Envelope upgrades are not eligible. The sale price will not be reflected in order summaries or email confirmations. Discount not eligible for orders placed prior to the sale. The discount will only appear after the order is transmitted and received by the lab. Offer expires at 11:59 p.m. on March 28th, 2019.